I’ve seen this quiz going around Facebook. You’ve seen it too. 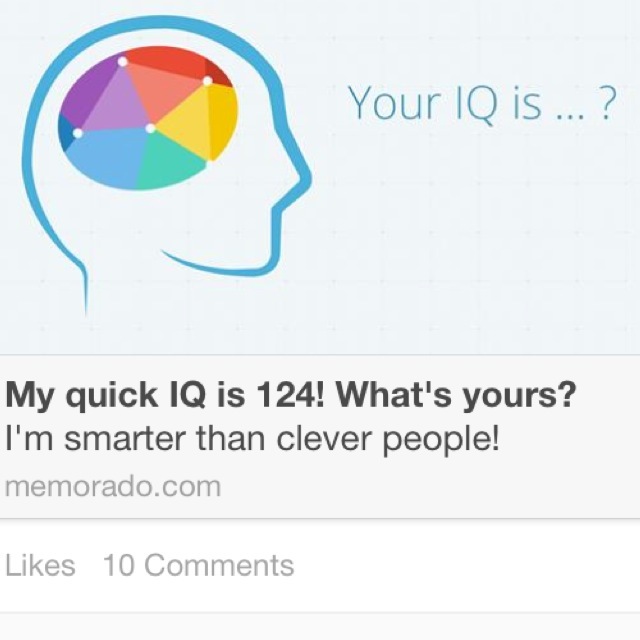 You answer ten or so short questions and voila–your IQ is tabulated. There is even a handy “share” button right at the end of the quiz so you you can tell all your FB peeps just how bright you are. Each one one of my friends that share their quiz results seems to be a genius. Every one of them! How can this be? Do I just keep the company of the elite, the super-brained, the above average? I am taking this moment to remind you and myself that the things you see on Facebook (or whatever other social media outlet you use to connect) is not the measurement of your worth. God has so much to say about your worth! Check out Luke 12:7, I Peter 3:4, and Proverbs 31:10 to see how God measures worth.